ISIS undertakes cutting-edge theoretical work in quantum physics, where the new sciences and technologies of quantum computing, quantum cryptography, and quantum teleportation are being created. The social and political consequences of this science-in-the-making, however, are promising and troubling at the same time. The project uses its privileged vantage point at the forefront of physics to question the potential future effects of such "pure research" in the areas of electronic communication and commerce, computing, and national security. 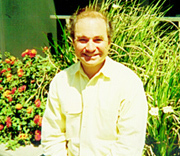 Above: ISIS supporter Mike Ubell of Informix is a computer scientist and co-founder of successful Silicon-Valley start-ups. 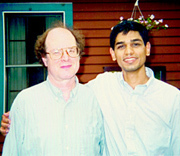 Below: Ashish Thalipliyal puts a friendly arm around IBM researcher and Institute collaborator Charles Bennett, (co)inventor of teleportation. 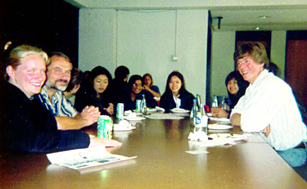 Above:5-College Student Summer Research symposium at Hampshire College, convened by ISIS president Dr. Herbert J. Bernstein. 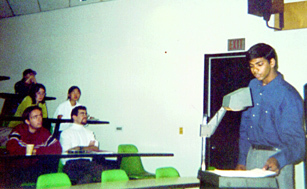 Below: ISIS student fellow Nikhil Swamy presents his work on Quantum Computation to the Five-College Symposium, in September 1998. "Experimental realization of any discrete unitary operator"
"How to Build Any Discrete Unitary Operator in Your Laboratory"
"Concentrating Partial Entanglement by Local Operations"
"A quantum circuit for OR"
"Quantum secure identification using entanglement and catalysis"
A realplayer video showing some of our IBM collaborators "enacting" teleportation in IBM backyard settings. There is one glaring error: the effect of changing one particle does NOT change the other instantaneously; nothing can make changes happen that propagate faster than the speed of light. What does happen is that measurements here can reveal the states of particles far away which previously were unknown -- and the revelation can happen faster than any transmission of the true state of affairs could have reached us.